How Is Prestige Yachts Making Boating Easier On You? Prestige Yachts will display the new Docksense System on a 460 Flybridge at the Miami Yacht Show. Prestige Yachts is consistently on the forefront of innovation, often finding creative partnerships with vendors to solve problems or enhance the customer experience on their products. Prestige recently won an award with Lewar, a leader in marine glass supply, at the annual Boat Builders Awards for their design of the aft cockpit door and electric window on the 590 Flybridge. Now, Prestige has partnered with Raymarine to introduce their patented new Docksense solution and technology to some of their new models. "Prestige is going to have a new 460 Flybridge with Docksense at the upcoming Miami Boat Show," said Frank Bongiorno, owner of SI Yachts. "We're excited to see the reaction from our customers when they attend the demonstration. Docking a boat can be a challenge for anyone in windy conditions. This takes the stress out of it and is a great solution for new boaters. Raymarine has invented what they call Virtual Bumper Zone Technology that is the basis for the Docksense solution. This technology augments the captain's skill at handling the boat by automatically initiating the propulsion and steering system if the boat is about to accidentally hit a piling, dock, or another boat nearby. Docksense uses FLIR machine vision camera technology and video analytics to "understand" the surrounding environment and acknowledge potential hazards. 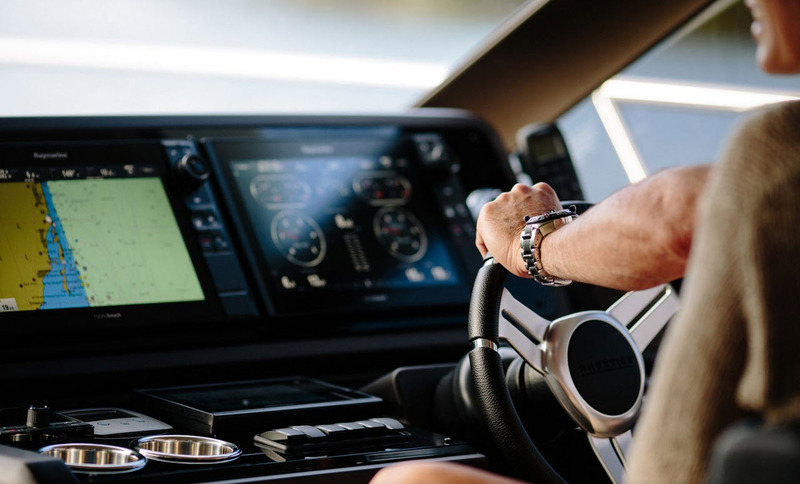 Once the hazard is identified, the boat's steering system automatically corrects its position to avoid causing damage. “The Raymarine DockSense solution will give future Prestige owners the confidence to dock safely and aligns with our vision to simplify the boating experience and make boating accessible to a much larger audience”, confirms Erik Stromberg, Prestige product marketing director. The Docksense Solution also integrates with any of the modern joystick propulsion systems ensuring that you will never again struggle when its time to dock. The Prestige Yachts 460 Flybridge is not your ordinary 46-foot boat. While the 460 Fly's exterior lines and windows look traditionally part of Prestige, the amount of space in the salon and on the flybridge are closer to a yacht in the mid 50's. There are multiple entertaining spaces on board including a L-shaped seat and dinette in the aft cockpit which opens up to an aft galley. This makes serving guests meals on the cockpit very simple. The flybridge on the Prestige 460 offers spectacular views and plenty of seating. The captain's chair on the upper helm has a seat next to it as well as a cushion in front of the console. A curved seating arrangement and table is positioned aft. The bow lounge with reclining cushions can easily fit 3 people and is a great sunbathing location. For more information on the Prestige 460 or to schedule time to see the 460 at the Miami Yacht Show featuring Docksense, give us a call today at (718) 984-7676.